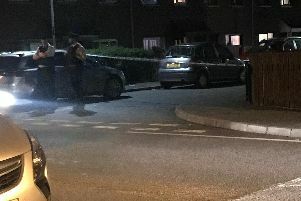 A 27-year-old man has been returned for trial to Craigavon Crown Court on a serious assault charge and causing an affray. Stephen Mark Thompson, Lawrence Square, Lurgan, appeared at a preliminary enquiry last Friday at Craigavon courthouse. The first charge against him alleges that on July 18 this year he unlawfully and maliciously attempted to cause grievous bodily harm to a male with intent to do him grievous bodily harm. He is also accused that he unlawfully fought and caused an affray on the same date. Thompson was remanded on his own bail of £500 to appear for arraignment at Craigavon Crown Court on January 19 next year.